The Brisbane City Council have proposed building a second ‘green bridge’ across the river next to the existing Victoria Bridge in a bid to ease bus congestion which now experiences chronic traffic congestion. Buses now sit gridlocked on the Victoria Bridge every morning and afternoon peak hour. The proposal includes a new tunnel under Adelaide street to move buses from surface roads and put them underground. There will be a $2 million feasibility study into the project which is estimated to cost around $2 to $3 billion dollars. The idea of a bridge and tunnel is not new. 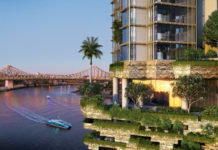 The idea is a rehashed expensive version of the bridge that was originally published in the 2005 Brisbane City Plan which proposed a Light Rail bridge running next to the Victoria Bridge. 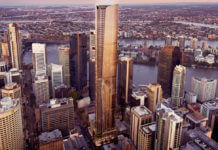 The original design did not include a tunnel under the CBD which would be the most expensive element of the $2-3 billion dollars. Today the BCC unanimously supported a $2 million feasibility study into the project which could cut 13 sets of traffic lights from a cross-city bus journey. Lord Mayor Graham Quirk says “this is not something that the council can fund in its entirety, absoloutely not”. This, despite the council funding the large majority of the $1.5 billion dollar Legacy Way car tunnel in the Western Suburbs. The hugely expensive price tag may also warrant investigations into converting the high frequency City Glider service into a light rail spline, should a new bridge and tunnel be approved. Light rail, which can hold up to six times the passengers that buses can would ultimately future proof the high growth areas of West End and the Fortitude Valley from capacity issues in the future. If built, this would be the first public transport project of it’s kind funded wholly by the Brisbane City Council. How about a Bridge further down river? Congestions is caused by the funnel effect of all the bus routes going through the culture centre.  Mare re route some of the southern buses to go over a bridge onto Kingsford Smith Drive? Why must Brisbane run most it’s bus services through the city ? this is foolish and is resulting in the Busway and Street congestion that is being seen. Only high frequency and capacity services should be running into the city. Brisbane should learn some lessons from Perth, that uses a hub system on the Joondalup and Mandurah lines that works well. Be great to see the busways converted to light rail and then simply feed buses to major stations from the suburbs. that annastasia pa… whatever, is such a negative, miserable minister!! anyways, i think this is a good idea. Currently the alignment of the Victoria Bridge is a bit ridiculous all the way along down Melbourne Street to the South-East busway tunnel entrance. The intersections in this part of South Brsbane are badly designed and dangerous. A dedicated bridge/tunnel would be a great opportunity to open up Victoria Bridge to more vehicular traffic and a realignment of the Cultural Centre Busway station. The Busway station should be sunkened and a tunnel to connect with the Busway tunnel under the Convention Centre. That station can be dedicated to SEB-way bus routes with West End and South Brisbane bus routes can still run along Victoria Bridge along T2 lanes to relieve the bus congestion currently occuring at this station. Also, it an opportunity to remove the intrusive Queen Street bus terminal tunnel entrance in front of the Treasury, opening up the area for an improved public plaza and less congested pedestrian walkway. The Queen st Bus terminus can finally be upgraded as well and remove half of the surface bus routes along Adelaide street. I am staggered at the proposed cost of this tunnel through the city. How can a tunnel for the short distance through the city on Adelaide St cost $2 billion when the several kilometres for Legacy Way (western tunnel) now being built is projected at $1.5 billion. If it was $0.5 billion it would probably be worth it. The bridge across from Adelaide St should go ahead even without an Adelaide St tunnel. For now, more peak hour buses should cross the Captain Cook Bridge and rejoin the busway at the Gabba to relieve the unnecessary congestion on Victoria Bridge. The 1.5b for Legacy Way (western tunnel) what a joke ! No way that will be built for that, anyone who has worked on any tunnels or busways knows they will not do it for that amount. Another blow out project real cost estimates just don’t get built. Pathetic. Instead, how about a 1 billion dollar traffic bridge/tunnel connecting Bulimba to Newstead? Save some cash and provide something we really need. It’s insane that there are no car bridges all the way from the city out to the Gateway Bridge, and yet so many concentrated around the CBD.